Erica Synths Fusion VCF is our take on a four pole lowpass filter. Each side of the double triode drives signal between 2nd and 3rd stage of the filter, while germanium diodes are used to limit the output signal. Eurorack модули Erica Synths Fusion VCF V2 Вы можете купить по выгодной цене в наших музыкальных магазинах в Москве и Санкт-Петербурге, интернет-магазин, доставка по России. 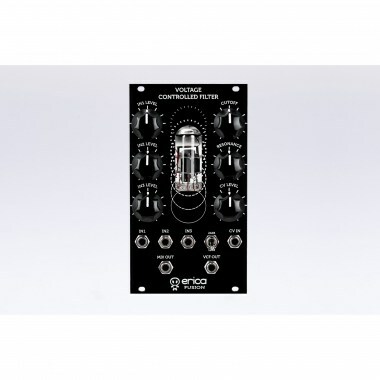 With this module you'll get an ultimately deep sounding VCF with a unique character. Ingenious resonance volume compensation circuit and filter slope selection makes it ideal for live performances. Bonus feature ﾖ 3 input mixer with dedicated mixer output. Try patching the MIX OUT into one of the mixer inputs, increase the input level until the mixer goes into self-oscillation and use the filter to alter the drone, you have! The Fusion VCF is an instrument on itﾒs own! 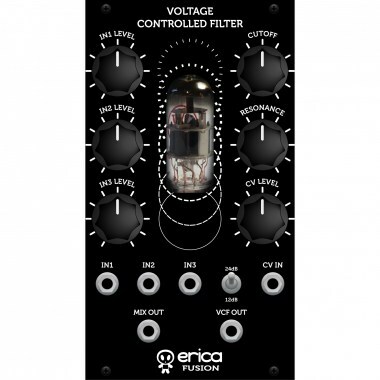 The Erica Synths Fusion series modules are designed combining vacuum tubes and semiconductors therefore they bring the warm, powerful sound and overdrive possibilities of vacuum tubes into your modular system. Erica Fusion series consists of a range of modules used in sound shaping circuit ﾖ VCO, Mixer, a real Ringmodulator using audio transformers and germanium diode ring, VCF, VCA and Analogue Delay/Flanger.